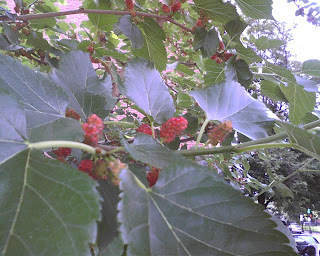 Looky here, a mulberry tree. Right? I am not totally positive at what point these can be picked, but if the bird poop that surrounded this tree last year is anything to go by, I need to wait until they are a MUCH darker purple. Also, I am not entirely sure what to make with them when I pick them. YUM Mulberries! At least I loved eating them when I was a kid. I would say jam or probably jelly if you don't want all the seeds. I would think they would need a flavor booster though? Sadly the birds were MUCH faster than me, and scarier, so I missed out! Rice Krispie Treats for the rest of us.